One of the many things I had to re-adjust to when we moved back to North Dakota was the lack of color in nature. Don’t get me wrong there are some beautiful areas in North Dakota like the Badlands. However, because of the extreme weather conditions many plants can’t survive here. Most of the flowers bloom in late spring and early summer. 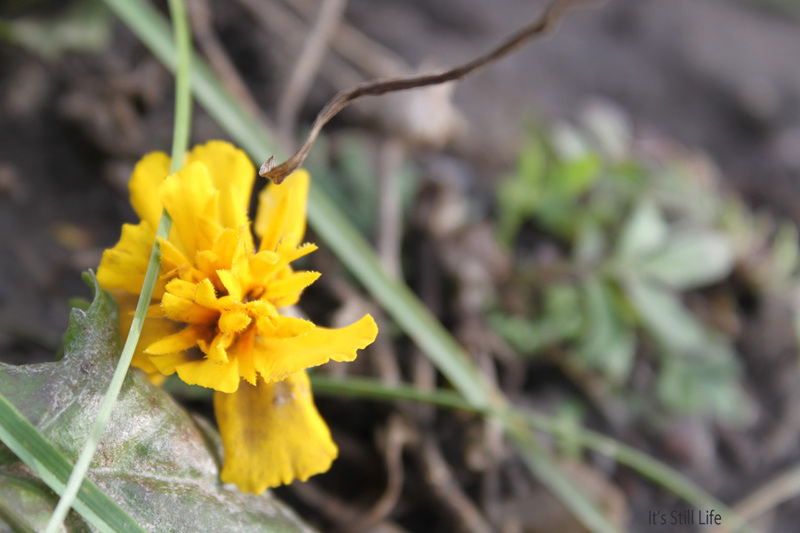 The other day I was outside and saw the remainder of this marigold bloom in the midst of mostly brown. Fall is hanging on and not giving in to winter yet. Oh but when it comes, it will come with a bang. I think you are right about the weather. Today we have been in the ’40’s all day and that is our Nov. weather. Plus tons on rain and gray skies – yuk! Oh well, that’s why I do crafts as there is no time to look out the window, lol. I liked your pictures from a while back and I thought they were great . Keep warm, it’s only temporary…….